Hi friends! I am excited to be participating in a Housewarming Party hosted by my good friend, Catherine Pooler. If you haven't visited her blog lately you will want to go check out her new look. It looks awesome! 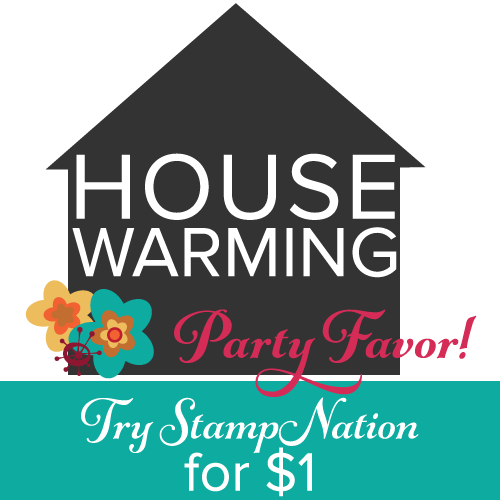 I love that she is celebrating with a party and a challenge where you have a chance to win some awesome prizes including, a one year subscription to StampNation, plus prizes totaling over $300 from sponsors. Before you go, leave me a comment and one lucky winner will win a FREE ONE MONTH STAMPNATION SUBSCRIPTION. I hope you will play along with this fun challenge for a chance to win some amazing prizes from different sponsors. Hop on over to Catherine's blog for all the details. Hi Kristie, Love this Christmas card, very pretty! Kristie what an awesome card, I love the ornament shape you created! Aw, Kristie, your card is the most prettiest ('scuse the grammer...LOL) thing!!! I adore the way you put the ornament around it and love the gold strip up the side. Makes that red really pop! Hugs, Sistah!! I love your sentiment and your card is so beautiful. . .
Beautiful use of rhinestones. I love it. I love the rhinestones, this is a great Christmas card. Love the house inside of the ornament. Such a cute card. I love Catherine's videos! I have wanted to subscribe to Stamp Nation but have been putting my money to crafting supplies. Thanks for the opportunity to win a free month's subscription! Your card is stunning too! I love the bling of the ornament! Love the rhinestone bling! What a great idea! Lovely card. I like the home ornament and the sparkle. What a cute card depicting a home and Christmas. Great card. Such a pretty card! I love the rhinestone ornament shape to frame that sweet house design! What a great card! I love the bling! Super cute card Kristie! I love the jeweled ornament shape around your cute little red house! Fabulous home inspired card! I like how you put the house inside the ornament. So pretty with the house inside the sparkly ornament! This is so beautiful Kristie. What a beautiful cozy home Christmas card, a great way to celebrate the new CP look! aww your card is amazing.. i love how you created that ornament around the house.. just lovely.. The ornament bling framing the house is clean & clever! Did you glue on all those rhinestones? My goodness that must have taken a lot of time but well worth it, Kristie. The card looks fabulous. It sounds like this StampNation is just chock ful of ideas and inspiration. I'd like to give it a try! What a pretty card. Congrats on your new home :) will be checking out Stampnation for sure. Love all the sparkle! I've been curious about Stamp Nation every time I see your post. Sounds like a good time to try it out!! That is a lovely christmas card. Beautiful card. What a fantastic design. Love your pretty sparkly card Kristie. How cute and clever to make an ornamenT shaped frame with the sparkly rhinestones! Love your card and the combination home and Christmas theme. Love the card & your wonderful use of rhinestones! Yowzers girl....your rhinestone ornament is amazing and soooooo perfectly straight! That's a whole lot bling to get lined up! Great job! Love how you placed your design elements on the left side of the card and used the silver ribbon of the bow to meld with the silver ribbon on the right side, creating a perfectly balanced card! Gorgeous card. Those rhinestones in their ornamental shape are an amazing frame for the house. This card is so pretty! I love how you outlined the ornament with the rhinestones and the red house with the smoke coming out of the chimney! So clever. Love it! What a fun way to frame and feature that house. What stamp set is that little house from? So darling. I've been looking for one just like it. I also love that it's red. Thanks! Very pretty. I love how you put the house inside the ornament. Very cute. WOW gorgeous! All those perfectly placed rhinestones! What a perfect Christmas card!